The Magus is your will. Enormous power may emanate from the will as long as we understand the necessary elements and disciplines that streamline and embolden its trajectory. ‘Willpower’, will inevitably fail us. In fact, socially we abuse ourselves, and each other, for a lack of ‘willpower’ in any number of areas in which we attempt to make changes, contributions, or pursue dreams. ‘Willpower’ and our belief that not only such a thing exists but that it is something one either has or does not have is misinformation at best, a full-scale set-up at worst. Forget all that completely. Regain your lucidity from any failures you may believe have come from this ‘lack of willpower’. ‘Willpower’ is an emotion. Emotions are fleeting. So, any project soars on this ‘willpower’ when you are emotionally high, and that same project falls completely to pieces when your emotions inevitably plummet. That is what emotions do. That is their job. And their job is necessary, powerful, and beautiful when applied and understood appropriately. However, to believe that The Will can be successfully applied from emotion is to believe a lie. Organization, planning, discipline, and support are the foundation of The Will. These are the mandatory requirements of flowing your power into the world. These are learned and developed over time on waves of failure and success, through periods of inspiration balanced with consultation. The Will is something you learn, not something you are born with or without. First lesson of The Magus: Reject all lies told upon the self. Why not start with this one? It’s heinous, really, quite destructive to the self, culture, society, the planet, our beautiful animal and plant species, our vast consciousness and certainly our power. This lie creates far too much shame and shame is deeply destructive to everything within The Great All and All. So . . . drop it and let’s get on with what matters . . . There is The Will and from it great power flows. The Magus is our master teacher on how to harness and direct The Will using the fundamental tools of its alchemy. 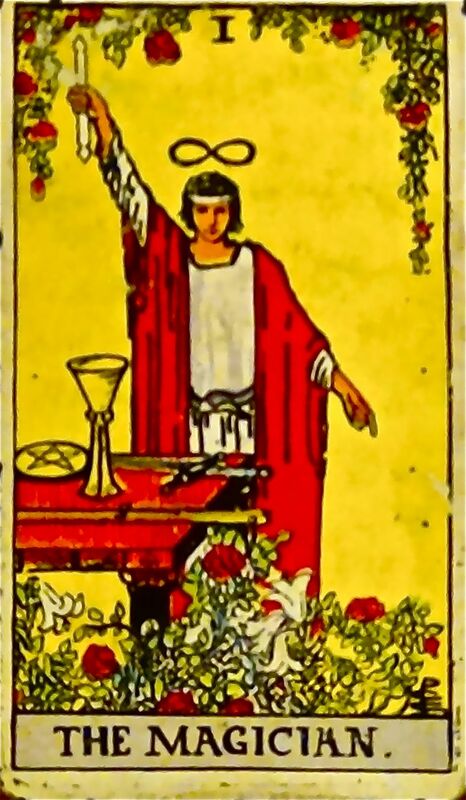 We can see in the Coleman-Smith rendering on this page, the four symbols of the Tarot suits: The Wand, The Cup, The Sword, and The Pentacle. The four, in any category, must be harmonized in order to utilize The Will. I’ll use a standard Biblical Myth to easily make the point: God harmonized the four elements in order to create our 3D reality. To make a piece of writing, music, visual art, to bake a cake, the center column is harmonized. And, indeed, these are Magickal Actions. To transform ourselves we use the third column. And this is the place of beginning for any of us who wish to harness The Will and allow its power to flow out of us and into our worlds. To do this is to engage The Great Work. Deliberate and disciplined creation is mastery and mastery is freedom. The Magus understands intuitively, grasps emotionally, analyzes intellectually, and feels sensationally the vast and ultimate truth that the universe is far from a chaotic whirlwind of broken pieces and shattered dust and is instead deeply, intimately, touchingly connected. The Magus sees through the powerful illusions we are presented with on The Terrace. The Magus sees how these illusions become adhered to who and what we believe we are. In mastery, the illusions are pulled away from our inner world and a truthful self is created in its place. The Magus is our moral independence and our spiritual development. Beware confusing Collective Individualism with True Individuation. In consumerist cultures we can easily see the Collective Individualism in our malls and our internet marketplaces. Are you the Goth Girl? The Sports Guy? What motifs do you identify with/as? We are offered packaged and externalized identities that provide a narrative/type to us and to those who witness our use and display of certain products and motifs, of certain brands and activities. Beware confusing these with individuality. At this moment in time, even our moral and political attitudes are pre-packaged in this way. Beware. Beware. Beware. Especially if you think you are not affected this way. THAT is the magic here. Those who believe they are impervious are the most vulnerable and often in ways we don’t immediately recognize. The imperviousness angle is even driven from within the propaganda spectacle itself. Which is to say, we are sold the imperviousness that makes us the most vulnerable to Collective Individualism and, simultaneously, the least likely to notice. We may askew mall products while we wholesale ‘purchase’ ideological packages or self and other assessments that destroy us deeply and permanently damage who we are. So . . . BEWARE. Be FEARLESS. Be HONEST. I mean it. The Magus is True Individuation and in this game, True Individuation is how you know where you are at any given moment. The Magus is your compass of self upon The Terrace. Transformation is the key here and learning to utilize The Will is the process of that transformation. 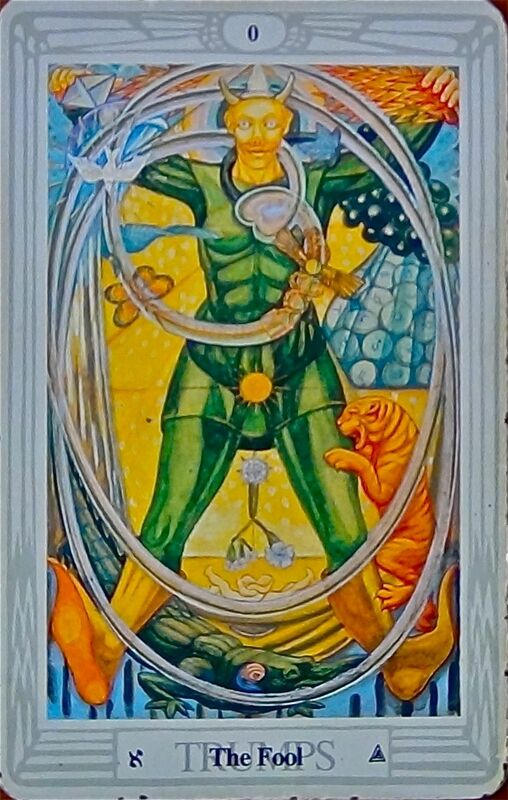 Look at the suits of Tarot: Wands, Cups, Swords, and Pentacles. Notice these constantly. Notice them all day long. When you experience creative inspiration, sexual desire, excitement about or toward any event or adventure or action or person or idea. . . these are your Wands. When you experience emotions, any of them, these are Cups. Especially notice feelings of love, deepen love every time you notice it. Do not ever let a little feeling of love pass you by, feel it deeper, make it grow downward as roots and upward as branches. Other emotions, like anger or jealousy notice these too. Remind yourself that these are your Cups. Remind yourself that these are emotions they are fleeting and avoid growing them upward or downward. Just notice them and say to yourself: Cup. When you make something, an act of creation whether it is baking a cake or speaking to others, these are your Cups, also. Ask yourself: What am I creating in the conversations I have? The words I choose, the tone I use? What are you deepening when you speak and act? Are your words and actions kind, true, and necessary? If not, why? What do really believe you can gain with any other type of action and speech? Will it work? Does it matter? Does it show your worth in truth? Your thoughts are your Swords. What are you thinking? Notice your thoughts and the images that accompany them. Notice every thought you have. Do not let a single thought or image go without your notice, you are a master, you know yourself completely. Notice every thought and every image and say to yourself: Swords. Anything material in your life are your Pentacles: Your dwelling, your car, your food, your clothing, and the money in your wallet, your job. When you engage these things, think: Pentacle. Do this. Notice what you notice and put that noticing into the proper suit. In time you will see how very important this really is, this work is vital to what we will do later with The Magus. Make this noticing a habit in your being. This takes time, but DO IT. Write or draw about the suits. Label entries in your journal, or as you write or draw or make notes on your studies (any subject) go back and notate which suit your creations are aligned with. You may want to collect the objects themselves and put them in a place where you can see and touch them to remind you to do this work continuously. The value of this cannot be underestimated as we move forward in the game. Eventually, the real and meaty work of The Magus in transformation through the power of The Will is to create our Analogies. Analogy is the language of ourselves and these Analogies are how the manifest world speaks to us. Prophecy and foreshadowing are simple when we have Analogic Language. 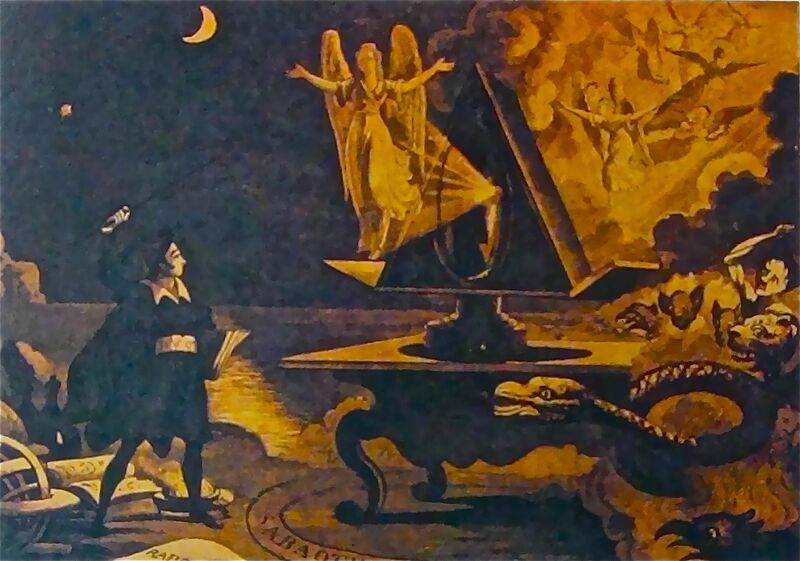 Magick is far from what we have come to understand as ‘Mystical’. Magick is reading and operating the material world as The Magus. That’s all it is. We will come back to The Magus and development of Analogic Language later. First, notice. Notice. Notice. Make a perpetual habit of noticing the suits. Write it down. Draw it. Focus. Transformation is the key of The Magus in a game where nothing is given without your focus. For those of you doing healing work with these keys, noticing our thoughts and emotions is vital. If you have Post-Traumatic Stress, you must NEVER allow a thought or feeling to bypass your conscious attention. The worst places you have ever been are always attempting to resolve themselves, to alert you to their ongoing struggle. These thoughts and feelings will do whatever they can to get played out in your present moments because they REQUIRE resolution. Notice them. Let them be what they are. Acknowledge them and categorize them into their suits. They may take up several suits. Example: A barn is a trigger for you, let’s say. You see a barn. That is a Pentacle. Anxiety ensues. That is a Cup. You think something, what is it? Don’t let it get away. What is the thought, the image? That is a Sword. Another feeling follows the thought. What is it? Don’t let it get away. That is another Cup. Follow yourself here. This is a PTS spiral and you can map it in order to transform it. Let it be what it is. No hating you. This is not failure; this is the process of the The Great Work. Write it down. All of it: The trigger object or word, the feeling that emerged, the thought that followed the feeling, the feeling that followed the thought etc. etc. You are mapping your spiral and taking control. The suits provide a means of pulling it all apart. The object, feeling, thought are DIFFERENT things. Not one big mess. It seems like one big mess, but it is not. This work matters. It matters. It matters. Remember: I LOVE YOU. Continued good luck in this game. First Knowledge: The Great Fool is you. In the story as I am telling it here, life is a quest, a game. In order to play you don’t need to believe anything. All you need is a world that makes sense within its own limits. Like any good fiction story, a world with its own rules must be created. And this is that world . . . When we enter the body, the amazing vehicle that permits our experience here on The Terrace, we forget everything we knew. Only moments before our arrival we knew everything, absolutely everything. We even knew what we came here to learn. We knew our purpose, we knew who we would meet and why, we knew many of the things that would happen. . . and then we forgot. It is The Forgetting that provides us with innocence. We forget so that we may begin in perfection. We forget so that we may witness our strengths and weaknesses as we navigate the often rough and confusing terrain of free will and chance combined with underlying purpose and destiny. We are all of this. Destiny exists, though we may choose to go against it. Purpose is ours, as we have desired it, though we may never access its path. Here, on The Terrace, we are free will in search of destiny. An undertaking only The Great Fool would bother to engage. You are The Great Fool. In other words, you are The Great Hero and every lesson you learn here, whether tragic or sublime, informs the infinite consciousness, The Master Everlast, as I call it in these stories. Everything you learn informs the knowledge of consciousness itself. So . . . learn well you Fool . . . it matters. The Great Fool is the you that encounters every event, every emotion, every thought, every word, every propaganda, every expectation as it is placed at your feet. 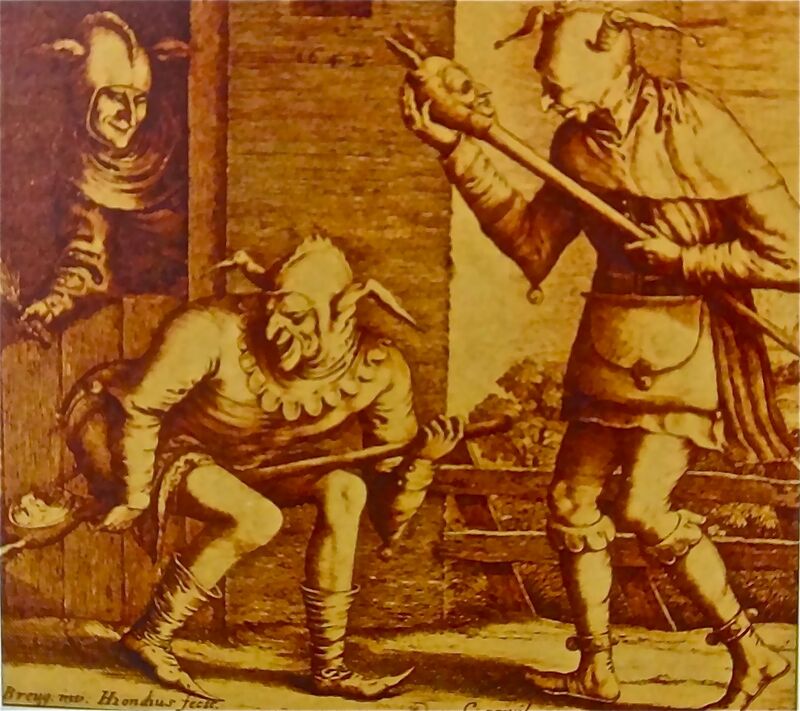 The Great Fool is deeply important as not only a character, but as a place inside of us. This is our being. We are always free in this place inside ourselves. Breathe deeply and think: I am free. I am free. I am free. Get used to going to this place because you will need it often in this game. You will need it everyday. This place is where the yogis and masters of all variety direct us to go in meditation or yoga. It is a solidity of self in full dignity and peace. The Great Fool is on The Terrace in body, yet is never caught-up in the events, even the emotions, that assail and compel, that satisfy and fulfill. Think of anything in your life and remember: I am not that. I am free. Think of the worst thing that ever happened to you, breathe and repeat the above words until you feel yourself detached. Now, think of the thing you are most proud of and say the same words: I am not that. I am free. Whatever we identify as, is never truth. As we move through our days it is vital that we can say wonderful things about ourselves: “I am a good father”, “I am a good friend”, “I am good at my job”, “I am good at my art”. All of it matters. And to be good at these things certainly matters. But none of it is who we are. Why is this important? For one thing, if we can understand that we are not the very best of our accomplishments, we can also understand that we are not the very worst of our experiences either. Further, if one is heavily identified with, say, “I am a good mother”, one is unlikely to stop and ask, “How can I be a good mother? Do I listen to my children?”. When we identify too strongly with one belief about ourselves our capacity for hypocrisy and blindness becomes strong. Take the best and the worst of yourself and detach from it. Go the The Great Fool within and become free to choose, to change. Become free to access your destiny and purpose. For those who have suffered trauma this place inside is the most vital of all to create. This is the place where you are safe to be exactly who you are. This is the place of well-being. You cannot be pulled apart by the elements, by the social orders. This is the place where you can simply be. Here you are free. You are much, much more than the worst things that have ever happened to you and the maladaptive feelings and behaviors that have grown out of these events. 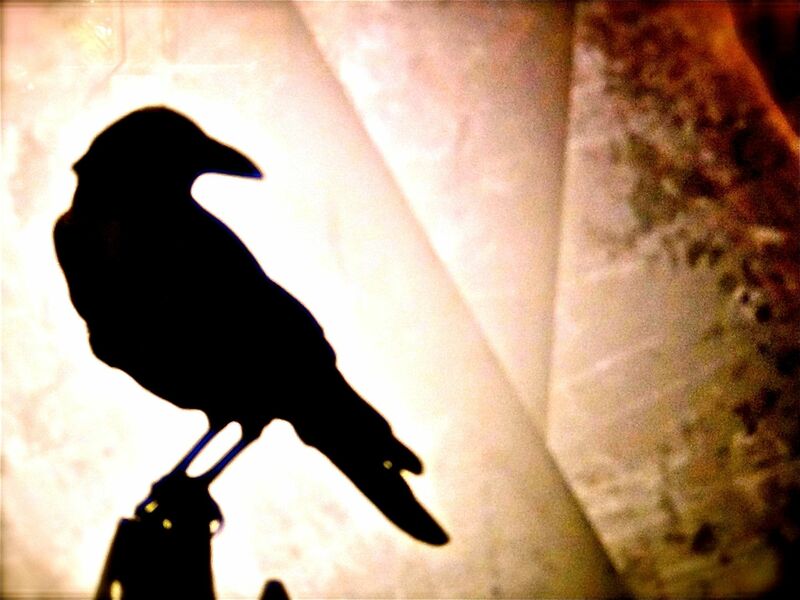 Take the best and worst of yourself and set it free like a bird into the sky. Take the best and worst of yourself, detach from these so that you may choose, choose, choose. Our free will is tacit though in our fear of freedom (which we rarely acknowledge), in our fear of others (whom we are taught to regard as out to get us), in our desire to see punishment and call it justice, we deny the very free will that can change our larger world instantly and are, therefore, easily ruled by those persons and organizations, by systemized machines of social functioning, that would use us against ourselves and against each other. 4. Be detached from the outcome. The Great Fool is you. Congratulations! You are free. You may choose.